Boulder County Transportation uses a variety of signage aimed at helping cyclists and motorist safely share county roads. We’re currently adding a few signs to the collection that will help remind motorists and cyclists about the rules for passing on county roads. 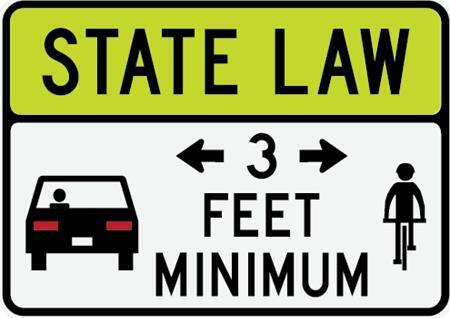 The new signs will be piloted on roads with significant motor vehicle and bicycle traffic that do not have shoulders where motorists typically need to cross the center-line to give bicyclists the required three feet of space. The three feet of space is measured from the widest part of the vehicle (mirrors or trailer) to the cyclists. This provides a margin of safety for bicyclists to maneuver around obstacles in the roadway when being passed by a motorist. These signs are regulatory as it is a state law. Many times motorists are unsure how to safely pass bicyclists with the required three feet on narrow roads without shoulders. 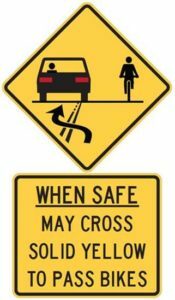 In Colorado, when it is safe and there is adequate sight distance and it would not interfere with oncoming traffic, motorists can cross a solid yellow line (in what is otherwise a no passing zone) to safely pass a cyclist. If there is inadequate sight distance, such as around a curve or before an upcoming hill, of if there is oncoming traffic, motorists must slow down and wait until it is clear to give cyclists three-feet of clearance when passing. These signs (below) will be installed on the same roads as the other new signs. They only advisory and not regulatory as this is not a law. To help develop the new signs, the Sheriff’s Office and Transportation Department worked with Cyclists 4 Community (C4C), a local non-profit focused on improving motorist-cyclist relationships and safety for all roadway users. We’d like to know what you think of the new signs. Please use the contact information at the bottom of this page, or complete our online survey.